Bristol Rovers have signed Millwall’s Paris Cowan-Hall on loan until January 2016. Can he possibly repeat his 2014/15 season sequence of scoring a goal in 5 consecutive games? Bristol Rovers’ Seanan Clucas battles for the ball with Wycombe Wanderers’ Paris Cowan-Hall in October 2013. He has previously played at The Memorial Stadium. He was part of the Plymouth Argyle side that lost 2-1 on 1st January 2013 in front of 7,332 spectators. First-half goals from Joe Anyinsah and Matt Lund gave Bristol Rovers a New Year lift with a 2-1 home victory. 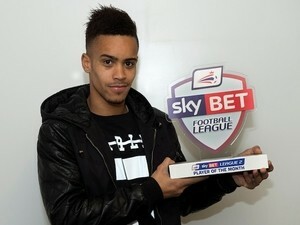 Wycombe Wanderers forward Paris Cowan-Hall was the League Two Player of the Month for December 2014. He had found the net three times in four matches in the month.